The Evil DM: This is how I roll! : Cortex Rules! 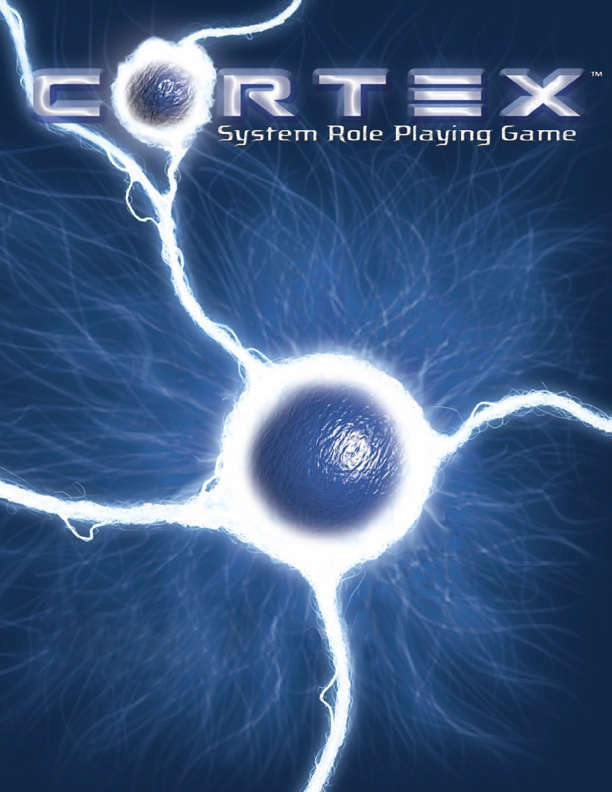 Its been out for a long time, and it dates back as far as the Serenity RPG game, expanding into the Battlestar Galactica RPG and finally its own core rules, known as the Cortex Blue book core rules. This book is much like the D20 Modern book in a way that there is no real theme to it, its not fantasy, space, or even the world of gangsters. The good news is that you can take this book, or toolkit as I like to call it and make it into any game you want to play that night. Designed by the Margaret Weis productions team, this toolkit was a sure hit. The system is your basic point-buy, skill based system more akin to Vampire than D&D (i.e. no classes). Characters have a series of general attributes (e.g. Strength) and specific skills (e.g. Guns). These are rated by a category of die: d2, d4, d6, d8, d12, d12 +d2 and keeps going. When you need to make a check, you roll the die corresponding to your attribute, and the die corresponding to your skill and add them together, giving the GM your results. The GM will determine based off the chart in the book what target number you have to score or higher. If you hit the number or over you are successful, if you score 7 points over the target number its considered a critical success. If all 1's come up on the die, its considered a "Botch", much like how it is in Vampire. For getting hit and taking damage, you do have a hit point type system, which is life points. But there is a few ways of taking damage, Wounds or Stun, in which if either one of the two equal your life points, you are knocked out (stunned) or dead (wounds). Things that stood out to most people, including myself, was that when you die or fall unconscious you get to make a few "save checks" which start getting harder each round as you struggle to stay awake or alive. It makes me smile, because it makes me think of that over acted William Shatner death. Another cool thing about the game, is plot points. Often referred to as Drama points in other systems, as these little points you collect can bend the lines the game in your favor. Your friend dies? spend the extra plot points to pull off an amazing round of CPR and save his life. So that's a basic look at the Core system that of course Margaret Weis Productions, no longer supports (but will sell) as they moved onto a more stream lined system called Cortex Plus. The PDF is going for 4.99 on RPGNOW.com. I highly suggest picking it up and seeing what you can make out of the game. Supernatural is the only game that really came out of the Blue Book Rules, the others were before and helped build the core as we see it today. There was once a great forum, done by a fan that held some great information about the Core system and what tweaks people did with it. Sadly that forum closed up and the info is lost. Makes me very sad.